As an exercise, I tested the P2 16 x 16 MUL instruction against the P1 subroutine and the P2 CORDIC. I didn't actually expect to find any error, and of course, didn't. For every possible pair of values (2**32 total), I multiplied three ways and compared the results. Here is a code fragment. 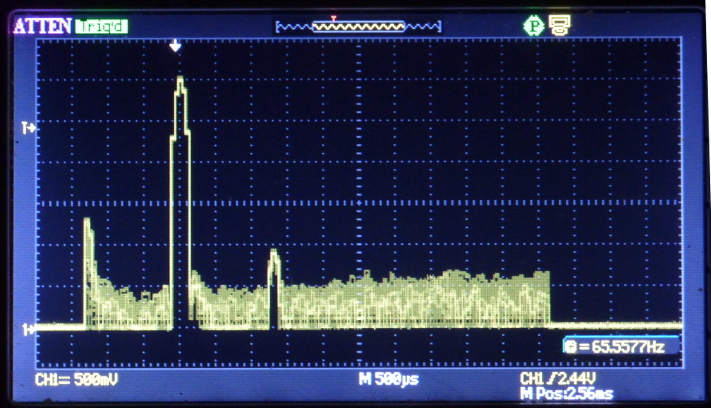 Each iteration takes 0.75 microseconds; each 64K takes 49 millisecs plus 4.6 millisecs to show progress on a serial LCD. The whole program takes just under an hour. I did completely overlap the CORDIC time with the subroutine. Didn't worry about another cog over-writing my result. I did not use the build-in serial driver; didn't even use the serial capability of the Smart Pin. I did modify the P1 subroutine to use REP, and sure enough, it got faster. Two instructions in the tight loop versus three. But it doesn't matter because the instruction is exactly equivalent and takes only 2 cycles. I've been MULS for FIR filtering and am working on IIR filtering using QMUL with corrections for signed operation. The spin2gui samples/ directory contains a program called multest.spin2 that does timing tests for 32x32 multiply using a software multiply, CORDIC, and mul instruction. The software multiply has an early exit so it does well for small values. It takes between 28 and 981 cycles. CORDIC is always 70 cycles, and the 32x32 multiply constructed from 16x16 MUL instructions always takes 44 cycles (all of this is running from HUB, so in COG memory presumably the software and MUL implementations could go a bit faster). The CORDIC of course has the advantage that it can be interleaved with other operations. But if for some reason you can't do that then using MUL to do 32x32 multiplies seems to be the best bet. The nice thing about IIR digital filters is a regular structure requiring (ideally 32 bit) 4 multiplies per second-order-section, and you can pipeline multiplies every 8 instructions leaving just enough spare instructions for the signed correction and housekeeping. Thus each section is about 1 cordic pipeline delay so you can reuse variables per section. as appropriate in the accumulation. Where d1, d2 are the delay state (per stage), a1,a2,b1,b2 are the coefficients. You could also try overlapping your cordic operations. i.e. start a new cordic operation before the last has finished. This should shve ~100 clocks off the total time. Talking of multiplies, here's a cordic pipelined complex multiply, using fix8.24 format real and imaginary parts. A complex multiply needs 4 signed multiplies that can all execute concurrently, and an add and subtract to tie the parts together. I think its about 108 cycles all told. The setup for the signed corrections is done without time penalty as the pipeline runs, so that its pretty close to optimal for a cordic implementation. In case anyone wonders, that's about 15dB per vertical division, 129 frequency samples (ie 256 FFT), from ADC running at about 48kSPS (ADC fed with a single sine wave from another pin in DAC dither mode). 2nd harmonic about 60dB down, fundamental 75dB above noise (12 ENOB?). Blackman window. I don't have my P2 with me to implement this, but a complex multiply can be done in only three multiplies using Karatsuba multiplication. Let A = xr*yr, and let B = xi*yi, since these show up in multiple places later. Now let C = (xr+xi)*(yr+yi) = xr*yr + xr*yi + xi*yr + xi*yi. The middle two terms are the imaginary part of the result, and the first and last terms are A and B, which we already have and can subtract out. So, zr + zi*j = (A - B ) + j*(C - A - B ). The disadvantage is that your multipliers have to be one bit longer than your input numbers; this isn't a problem on the P2 if you're multiplying signed numbers, because QMUL is unsigned, so you already have to manage that extra bit anyway. See Wikipedia's article for more details. Larger multiplies composed of smaller multiplies can be done similarly: just replace j with 2^32 or 2^16. I briefely mentioned in the other multiplication thread that they could use it for long multiplies. Also, can't you replace each complex multiply by a twiddle factor in an FFT with a single QROTATE? That's really hard to read since the convention is to call a complex number z = x+iy as its the point (x,y) on the Argand diagram. negate at the end and 3 or 4 instructions overhead before feeding the pipeline. simplicity of not having to deal with overflows probably wins out. You need to know where the file is. Mark's one above is a URL to a picture he's placed on another website. Another way is to upload a new picture with the "Attach a file" right below the edit box and use that. Once uploaded a small icon of the picture will appear. Hover over it, there will be an "Insert Image" you can click on. Clicking that will add the pitcure's URL to your edit box.